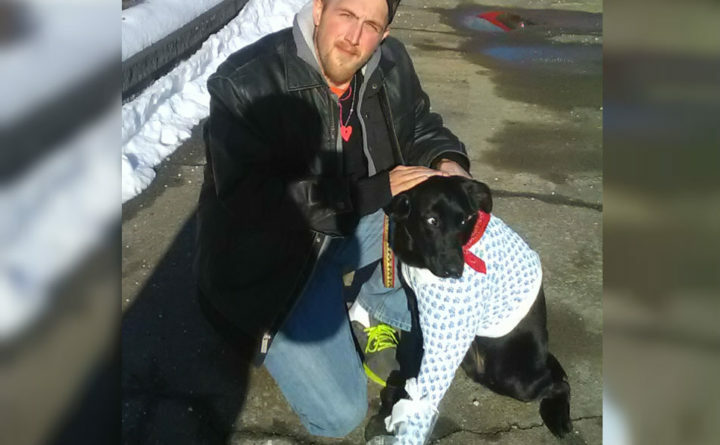 Dustin Gray, 29, of Orrington, and his 11-month-old puppy, Clover, were attacked by a bear in the woods off the side of Route 1A in Dedham on Feb. 5. Gray was treated for bruises and scratched on his hands and arms, and Clover is still recovering from an open wound on her back. An Orrington man said he fought off a black bear that attacked his puppy in the woods off of Route 1A in Dedham. Dustin Gray, 29, had pulled to the side of the road and wandered about 50 feet into the woods to let Clover, his 11-month-old lab mix, pee, when a black bear attacked the puppy. Gray said he punched and kicked the bear until it stopped biting her, which prompted the animal to knock him over as it ran off. “I stuck my finger right in its eye,” he said. “This does not happen, except in freak instances, and Monday was a freak instance,” Fish said. It appeared to be the first time in Maine that a human had fought off a bear since 2010. Black bears, which rarely attack other animals, hibernate in dens during the winter months, and typically don’t emerge until spring, Fish said. It’s likely that the bear in this case had recently relocated to the spot off of Route 1A after last month’s heavy rains flooded many of the area dens, and the bear hadn’t fallen back into deep hibernation, he said. “Definitely that was the last thing on my mind, seeing a bear in the winter,” said Gray, who walked away with only scratches and bruises. Clover is in worse shape, and still recovering from significant puncture wounds, he said. Monday’s attack occurred around 3:30 p.m., after Gray and Clover walked into the woods off of the eastern side of Route 1A, less than a mile from the Lucerne Inn. He was gazing off in the distance when he felt the leash rip from his hand, and he turned to see a “a big, black circle of fur” mauling his puppy, he said. He charged toward his yipping dog and kicked and punched what he soon realized was a black bear, he said. When he jabbed it in the eye, the animal reared up and knocked him to the ground, he said. “I thought it was ready to eat me, like it was my turn,” said the 6-foot, 5-inch construction worker. But the bear sprinted off, leaving Gray winded and bruised on the ground. The altercation lasted about 30 seconds, Gray estimated. After the animal fled, Gray rushed to Eastern Maine Medical Center in Bangor, where he handed off Clover to his ex-wife, Ashton Warf, who took the puppy to the emergency vet. Gray was treated at EMMC for minor scratches and bruises to his arms and swollen hands, and his chest is still sore from where the bear slammed against him, he said. On Friday morning, Gray and Fish trekked back to the scene of the scuffle. There, Fish found a three rocks that had formed a “mini cave.” Inside, Fish said he found evidence that a young bear, likely about 100 pounds, had laid there for a short period of time. When they’re hibernating, bears are “lethargic, but they can be jostled awake,” and Clover’s rustling likely did just that, Fish said. The den was unusually close to a busy roadway, “but a younger one doesn’t necessarily know to go back into the woods,” Fish said. Still, Monday’s encounter was extremely rare. Since the 1980s, fewer than a dozen Mainers have fended off a bear, and none have died, according to BDN archives. The last reported physical encounter between a human and bear was in the summer of 2010, when a 365-pound male charged the hunting guide who had shot and chased him in the woods of northern Penobscot County. Last July, an Auburn man and professional runner managed to outrun and avoid contact with two black bears who chased him on his morning jog.